It was our final day in Las Vegas, and Happy Meal. The Marinater, and I made the trek to Bachi Burger only to discover a sign on the door, which stated that they were closed on that particular Tuesday. I had called the previous day, and the phone message made no mention of that teensy detail. 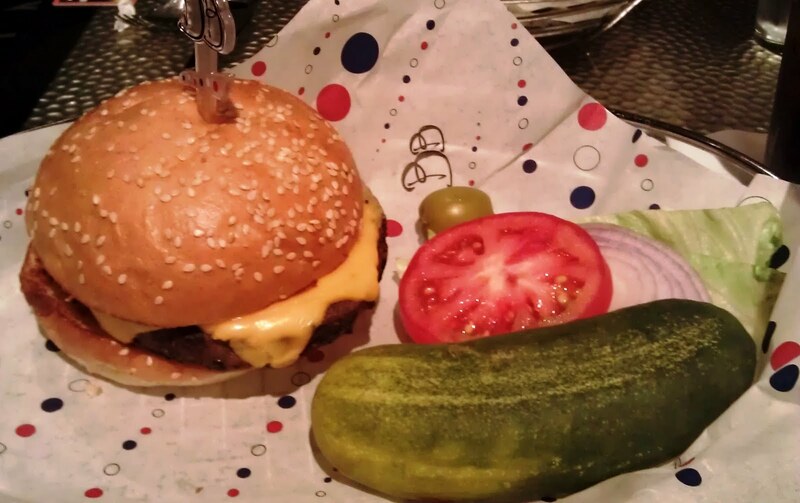 No matter, we had a backup plan, and that plan was Le Burger Brasserie at Paris Resort and Casino. I cursed Bachi Burger under my breath and turned the car back towards the strip from where we had just driven. Le Burger Brasserie was touted as a sports bar. They had plenty of TVs on the walls, but they were playing canned music, and the theme was not remotely sporty. This was fine, since I was not looking forward to the din, which is generally associated with sports bars. This was how their website described the burgers. At Paris Las Vegas, Le Burger Brasserie is a French interpretation of an American classic: a lively meat-and-potatoes Sports Grille featuring the world’s most creative burgers. I was unable to discover the most creative burger in the world on the menu, but I blamed this on over-zealous marketing hype. I did locate a burger that was exceedingly costly...the 777 Burger ($777) This was a Kobe beef burger with Maine lobster, caramelized onions, imported Brie, 100-year aged balsamic vinegar, and crispy pancetta. The price included a bottle of Rose Dom Perignon Champagne. Even though Happy Meal can hold his liquor, neither of us were in the mood for pancetta, so we ordered a couple of the Le Classique burgers with American cheese ($11.99 each), an order of french fries ($4.50), and a couple of soft drinks. Our wait was just over 20 minutes. My burger was overcooked on the first try, and I sent it back. Within 5 minutes a properly cooked (Medium) replacement arrived. Chef Carlos Martin checked in with us to make certain that the re-fire was properly cooked. 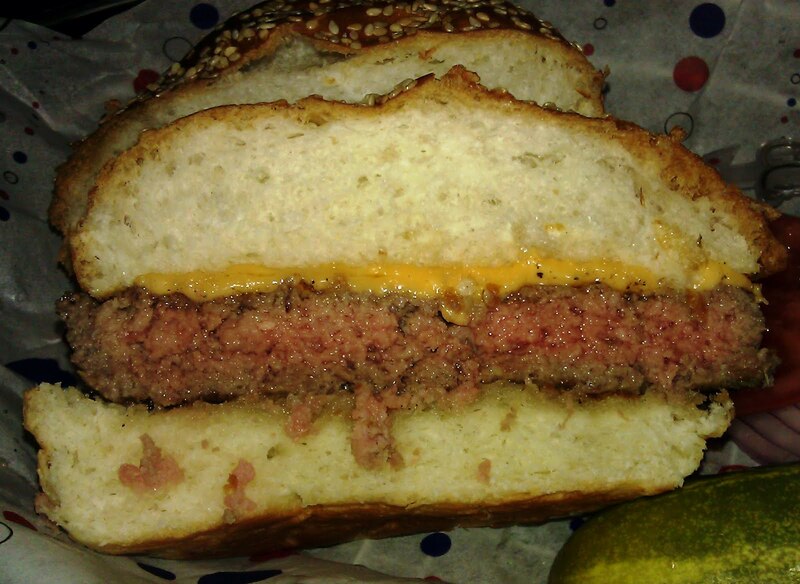 The Meat: The beef at Le Burger Brasserie was 25% fat, 100%, Black Angus Chuck. It was freshly ground by the on-site butcher and delivered pre-pattied every morning. They offered other freshly ground meats. These were chicken, lamb, turkey, Kobe beef, and salmon. The 8-ounce, Chuck patty was very juicy, and tasted quite strongly of beef. The beef was not aged, but it did carry a mild funk, which was pleasant. The beef had a simple flavor profile near the edges, but it grew more complex near the center where the beef was rare. It was only here that the iron from the fresh blood came through to round out the bite. The Seasoning: The exterior of the burger patties were perfectly salted on the grill. 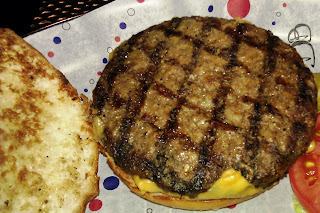 The Sear: The flat, uniform patties were grilled, and they picked up a pleasing diamond sear pattern. The sear was not sufficiently deep, crisp, or thorough to bring out any heartiness in the texture or the flavor of the burger. However, this was a relatively thin burger patty, and a really strong sear would have been difficult to pull off with out dramatically overcooking the beef. The Preparation: I was impressed at the evenness of the cooking. The cooked layer of beef was nearly identical in depth on both sides of the burger meat. In spite of being flipped 3 times on the gas grill, the cheeseburger retained its juiciness. This spoke to the freshness of the beef. The Cheese: We had 11 types of cheese to choose from, and we went with the American. Le Burger Brasserie applied 2 slices of the savory cheese to the burger patties and then melted that under a broiler. Like the cheeseburger at Create, this was delicious. The broiler lightly browned the cheese to bring out even more flavor. The Bun: There were 6 bun choices, and we ordered our cheeseburgers on the white, sesame-seeded buns. All of the buns at Le Burger Brasserie were baked daily on-site. The relatively neutral bun carried light notes of savory and yeast. The bun was moist and tender, but it held up well against the juices of the burger. The bun was toasted, and there was a nice crunch around the edges. The Fries and Rings: Both were Lamb Wesson products. Le Burger Brasserie did improve upon the already solid fries by dipping them in a batter prior to frying. 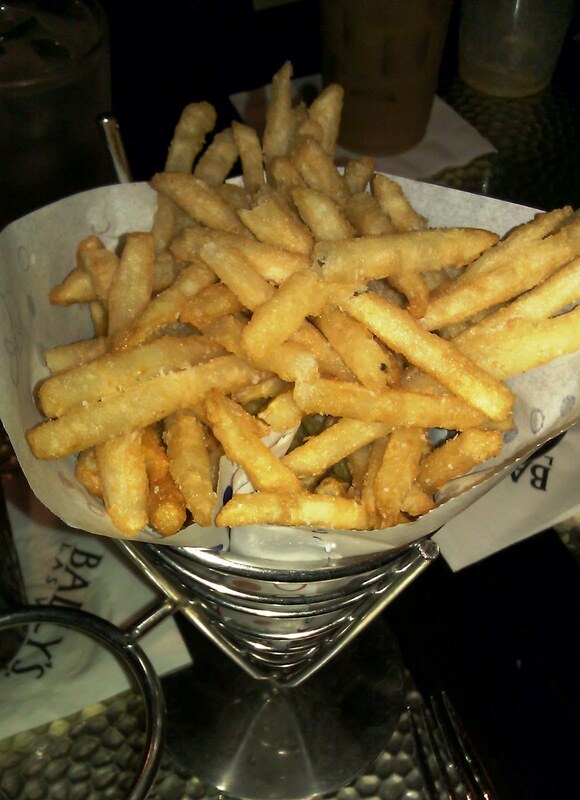 The fries and rings were both perfectly crisp and golden from the canola oil. The seasoning was spot on. The Toppings: The tomato slices were juicy and sweet. The slab of Iceberg lettuce had brown mottling on the underside--this was inedible and had no business being on a plate. 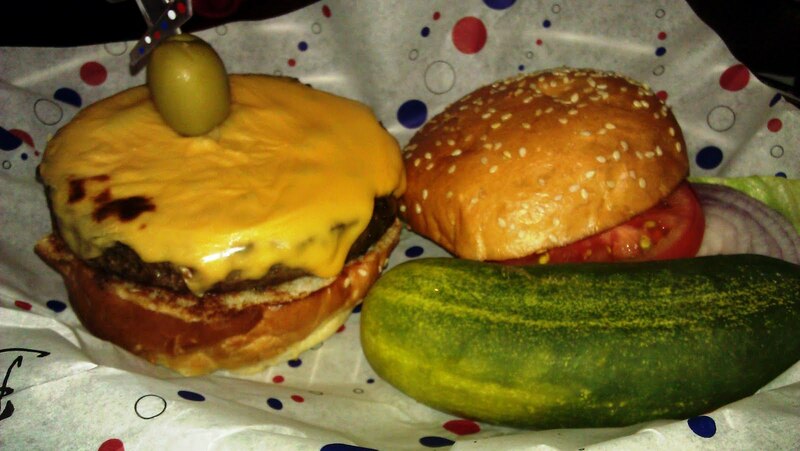 The sour pickle spear was quite good--it reminded me of the pickle that I had recently enjoyed at BLT Burgers. The Value: 12 bucks was a lot for Chuck, but this was a cheeseburger on the Las Vegas Strip. The value was comparable to other burgers in the same class. Accordingly, the value was average. $4.50 for an order of fries was on the high side, though. Le Burger Brasserie was a fine way to finish off our father and son Las Vegas trip. The burgers were hearty and satisfying, and the fries were delicious. Burger Review : Le Burger Brasserie served up a better than average burger for an average (Las Vegas Strip) price.